Set amidst 27 tropical acres along a half-mile stretch of famed Ka`anapali Beach, this truly unique Hawaiian resort offers natural beauty, traditional Hawaiian ambiance and five-star service. After a $33 million Lahaina Kai Tower refurbishment, the resort features luxurious island-inspired rooms designed to entice the senses and connect guests with their tropical surroundings. Each night, the resort hosts one of Maui's longest running and best luaus. On the north end of West Maui's Kaanapali Beach Resort, three miles north of historic Lahaina town. 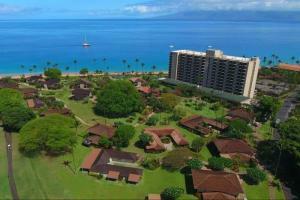 Approximately 10 minutes from West Maui Airport and 40 minutes from Kahului Airport. Royal Ocean Terrace, Basil Tomatoes Italian Grill and Royal Scoop Snack Shop. Tour Desk available on property to arrange all types of excursions such as Volcano Trips, Helicopter Tours, Hana Adventures, Sailing Trips, Golf, Snorkeling, Scuba.